Whether it is riding a bike, hiking, camping, or kayaking at night, a headlamp will give you excellent light without interfering with your activities. Fenix hl60r is a wonderful headlamp with great features. This Cree light is created from strong high grade aluminum with a hard anodized finish. Fenix hl60r headlamp provides a maximum of 950 lumens which are bright enough to light the entire camp or your trail path. It can be used as the survival flashlight too. The glass lens is also tough for securing the led bulb. Read this Fenix hl60r review to know more about this headlamp. The side switch on the headlamp can be switched on in a cycle to light one of the 5 different light modes. Also, the lamp comes with a characteristic red light that can be used at night and it runs on 1 lumen. The maximum run time of the led headlamp is 100 hours with a maximum beam distance of 116 meters. Get to recharge the light when it runs out by inserting the USB port in a USB power supplier. It uses one CR123A battery and has a reverse polarity protection for safeguarding the flashlight in case the battery is placed in the wrong way. Read on to understand more about the Fenix hl60r rechargeable headlamp. 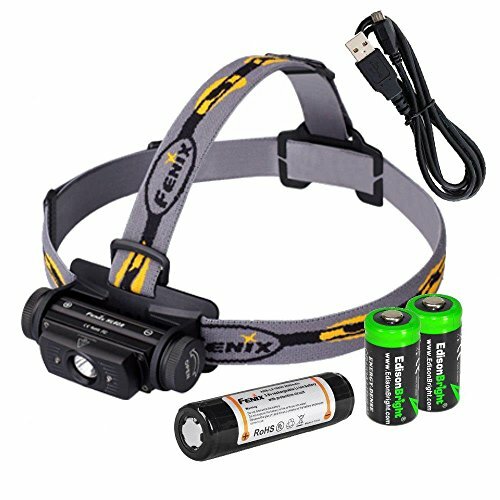 3 Where you can use Fenix hl60r headlamp? 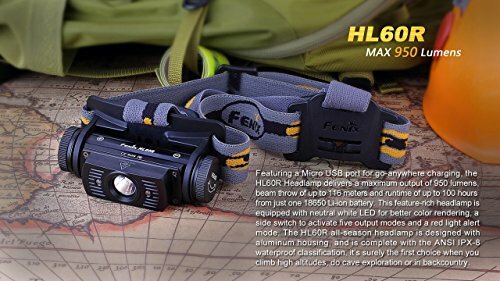 5 Why buy the Fenix hl60r headlamp? Where you can use Fenix hl60r headlamp? Why give yourself a hard time holding a torch when you can acquire a quality and easy to use headlamp? 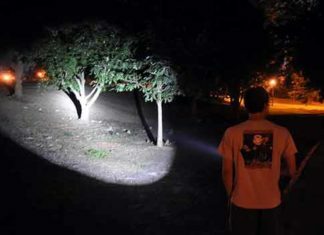 When you’re faced with danger in the wild or just busy carrying out other activities, holding a flashlight may seem challenging or even slow you down. The best thing to do is to buy a light source that will give you light without interfering with your work. This is what you get when you purchase a headlamp. So, Fenix hl60r is worth buying? Read this Fenix hl60r review & know the answer! 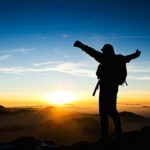 Why buy the Fenix hl60r headlamp? Sturdy construction – this is a well built lamp. The high grade aluminum construction makes it to be sturdy together with the hard anodized anti-abrasive finish. To add on, it has a toughened ultra-clear glass lens with anti-reflective coating. This protects the led from being damaged. Versatile use – the hl60r is a lamp that can be used in different settings and weather. First of all, it has 5 different lighting modes. These allow the user to have control on how the battery is utilized. Also, the turbo or brightest mode can be used as a protection weapon as its light is enough to disorient an enemy. Furthermore, the lamp can be used in water as it is IPX8 waterproof rated. This means that it can be used underwater up to 2 meters. Has reverse polarity protection feature – the light comes with a reverse polarity protection feature. At times, people do insert batteries in the lamp on a hurry. To prevent bad battery placement, the hl60r light has a reverse polarity to prevent the lamp from being damaged from bad battery placement. Easy to use light – I’ve heard some people complaining that this light is very challenging to use. This is not the case, from the side switch to the long press switch, all of these are built for easy use. Then switch of the light is placed sideways unlike other headlamps where the switch is placed on the top. This enables the user to access the switch on either the left or right side. Also, the switch needs to be pressed at least for 0.5 seconds for it to light. This feature prevents accidental lighting of the lamp to take place. Also, it is digitally regulated output ensures that constant light brightness is maintained. Uses cree led bulb – the Fenix hl60r rechargeable headlamp comes with an LED bulb. The bulb has a lifetime of 50, 000 hours and a maximum of 950 lumens. Furthermore, it has a beam distance of 381 ft which is just outstanding. LED bulbs are the most durable and can withstand impact. The led found in this headlamp is CREE xm-l2 t6 led technology. It produces white led light which has the ability to light well in the dark, smoky, or dusty areas. Feature packed headlamp – one of the best things about this headlamp is that it comes with various features that makes it to be outstanding in performance. Such features include the side switch, reverse polarity protection, USB port, CREE led bulb, and many others. Uses rechargeable battery – when you run out of power, charging the headlamp is very easy. It comes with a USB port and rechargeable battery. Buying or carrying batteries can be a hard task and that’s why having this headlamp simplifies things for the user. Connect the USB port to a USB power supplier in your car, home or use solar while in the wild. Warns you when the battery is low – before the headlamp ruins out of power, the led lamp comes with a battery indicator features that lets you know the remaining light. If you see a white led flashing, this means that more than 70% is remaining. While white LED and two red LEDs flashes means that it is between 30% and 70%. But if you see a two red LEDs flashing, then you should know that it is below 30% and needs to be recharged. Fenix offers limited lifetime warranty – I personally prefer buying devices with warranties. At times, you can get a device that has one or two things missing or has some issues with its system. In such a situation, a warranty will cover you and have everything put in order by the brand. That’s what Fenix offers – a lifetime limited guarantee. Fenix is a top brand known for creating quality flashlights. This is a US brand and meets all the regulations and standards of flashlights. Fenix has specialized in creating durable and high performing lights. Normally, they use high grade aluminum to make their flashlights. The Fenix hl60r lamp is no exception as it is well built for reliable performance. It is suitable for hunting, bike riding, hiking, and other outdoor use. The Fenix hl60r led headlamp is a bright light with a maximum of 950 lumens. It uses an indestructible LED enclosed in a tough glass lens. The brightest mode has the ability to reach up to 116 meters, which make it to be reliable for use outdoor. These and many other quality features that we’ve mentioned above make it to be great for outdoor use. If you are going camping or hiking or to take photographs at night, the hl60 led headlamp will provide you with consistent light and the battery level indicator will alert you when the battery is low. I hope this Fenix hl60r review is helpful to you.